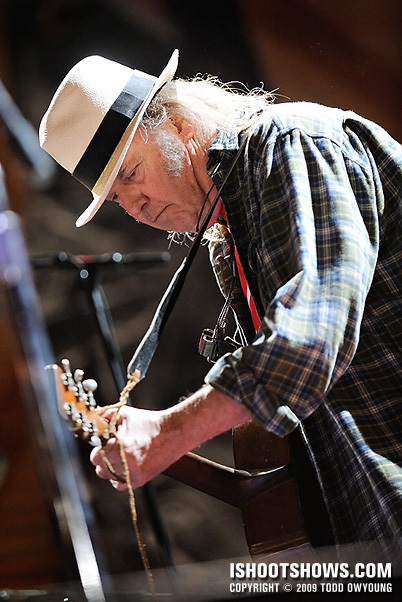 Neil Young was one of the reasons I was most excited for Farm Aid, due to the fact that the singer infrequently allows photographers access to him, and the yearly benefit is one of those rare occasions. One additional treat was seeing Dewey Lyndon “Spooner” Oldham accompanying Neil Young on the keys. I had the pleasure of photographing Oldham earlier this year when he was honored at the Rock & Roll Hall of Fame Induction Ceremony for 2009. 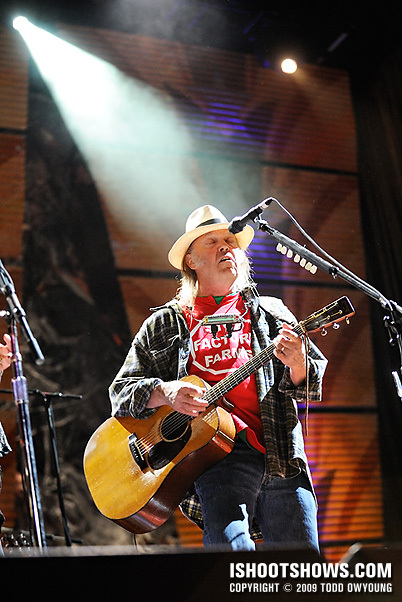 As I mentioned in the post for photographing Willie Nelson, press shooters were divided into two groups for Farm Aid 2009. 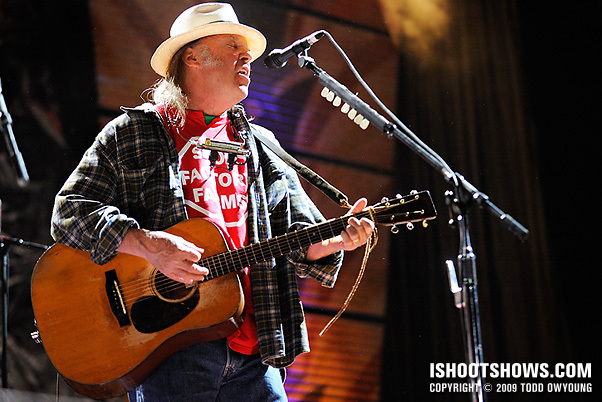 I was in the second group for Neil Young's set, so I shot songs three and four. Due to this situation, I shot sparingly and delivered no images from that first song. Thankfully, for the second song my group shot, Young put down the harmonica, so that's when I let it rip, so to speak. Aside from the harmonica, one other big constraint for this set was that we were only allowed to shoot from about a quarter into the stage from stage right, so all press were shooting Young's right side. I was at the front of the group going into the pit, so I got a decent spot. 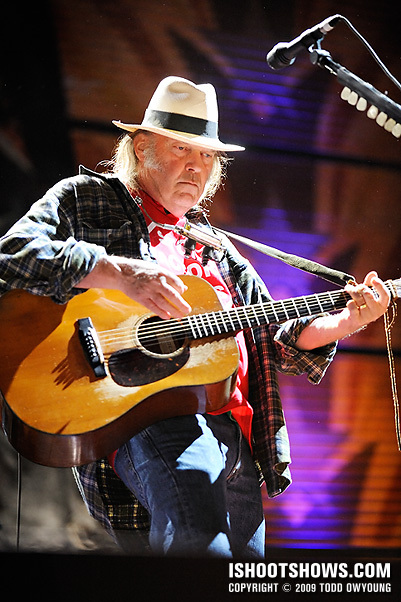 For those at the back of the pack, the situation would be have been much more difficult due to the angles and mic stand stage right of Neil Young. Aside from the aforementioned challenges, one other big factor for this shoot was the lighting. 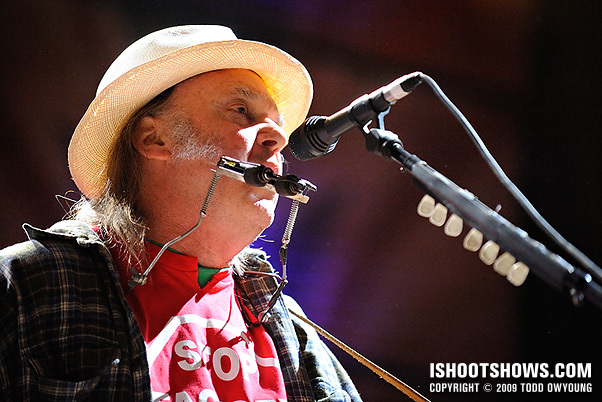 Don't be fooled by the above images – it was dark for Neil Young's set. He was lit by stage left by white light, which left the rest of his face is relatively open but still deep shadows. The hat Young wore compounded this factor. My approach to this challenge was to simply let that white lighting blow out and to expose as much as possible for the side of the face in shadow. My exposure for this set hovered around 1/125 at f/2.8 at ISO 3200. While I could have bumped the exposure to ISO 6400 for a faster shutter speed, this is one instance where the superlative image quality of the Nikon D3 has spoiled me to such a point where I end up using lower sensitivities than I could. ISO 1600 on this camera is just so clean for my uses that I find my self shooting as close to that “base” ISO as possible. Todd, love the 4th shot down of the, what looks like, piano player. He has the look of someone who enjoys and takes in what he does. Hi Jordan, thanks for the comment. 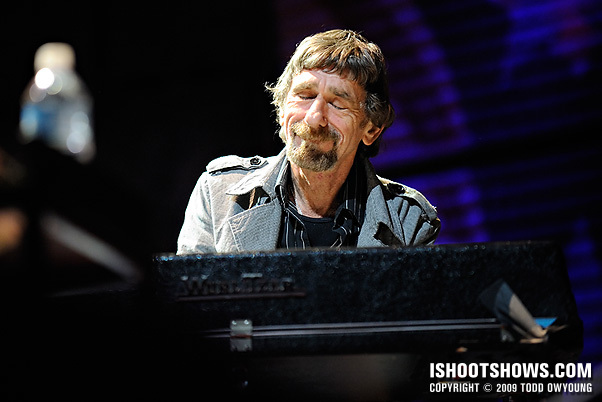 That’s Spooner Oldham – I was happy to catch that expression on him. You’re right, it certainly looks like he enjoys his job. Your exposure strategy worked perfectly making it look like there is a ton of light and the hat is actually diffusing the light and bouncing a bit back on his face too. These are some of my favorite shots of yours! Thanks for the comment and feedback on the exposure strategy. These photos aren’t what I would call truly faithful to the lighting, but there wouldn’t have been much to share if they were. I constantly have an issue sometimes where although I’m telling the camera to focus on a certain spot, it will focus somewhere else near the spot. For example, when I tell it to focus on the performer’s face and instead it picks up the mic. What am I doing wrong? Lorraine, this sounds like an issue with the AF points and technique. Basically, the short answer is that the AF points are larger than they appear in the viewfinder and cover more area. They are also prone to picking up on areas of higher contrast, so a shiny mic is a prime target. Make sure you have your AF mode set for manual selection, not a dynamic mode. Honest shots of an honest performer. 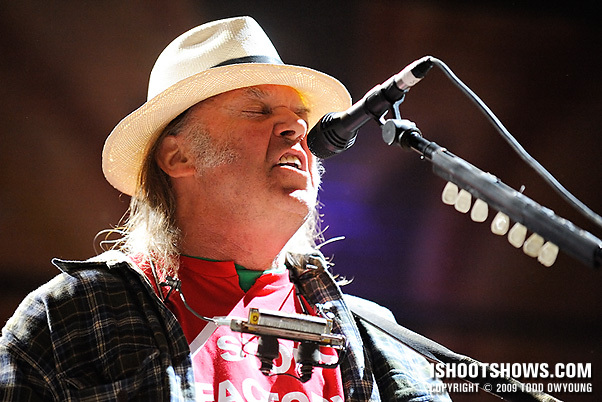 Guys like Neil Young are the reason I wanted to start shooting shows. 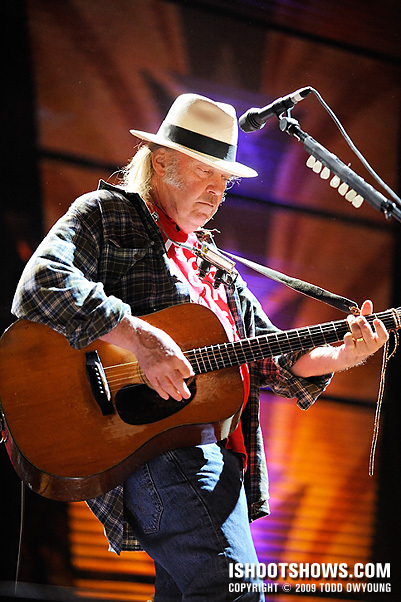 How can you not think of four decades of music history when he’s mentioned!? Even the most enduring artists will be gone one day, and we need to get some good frames before that happens. Hi Jason, thanks for the comment. Yes, part of the appeal is the chance to make an iconic image of legendary performer — as well as those not so famous as well. Always a noble goal, I think. Another great set, Todd. Despite your ‘challenges’, you still managed to crank out some nice images. I saw him a year ago and he blew me away. His second song was a 10-min version of Hey Hey My My, and if he had walked off stage after it, I would’ve gotten my money’s worth. One of the few times I’ve actually had goosebumps during a performance. Hey Doug, thanks for the comment and kind words. I have to say, I wonder about the images made from other shooters farther down the line. The mic stand/guitar headstock of the player to the right of Young was a constant problem, even from my position — it could only have been much worse for other photographers. You’ve proven that blown highlights aren’t always a bad thing. Love they way they make these shots look. Blown highlights aren’t always bad – it just depends on what part of the image is blown. The most important part of exposure is determining the hierarchy of the image and how values are assigned. For me, blown highlights are only a negative when they distract from the most important parts of the image. I think you’ve just given me an idea for a new article, thanks! No problem Todd, looking for ward to the article. Can I ask about your workflow for processing RAWs or would that be like asking for the recipe to the secret sauce? I see you use Capture and photoshop, but which do you use for color, exposure and curve adjustment, sharpening and noise reduction? 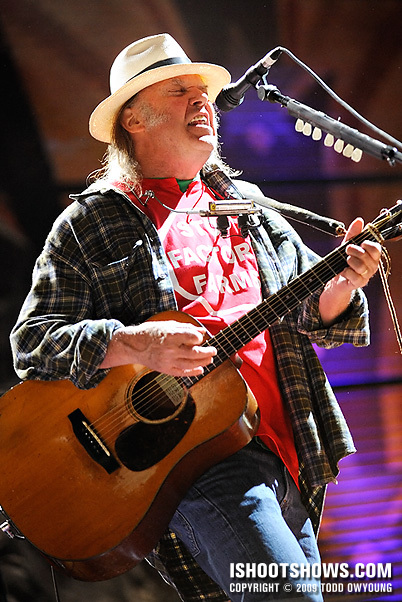 Todd, I thought that Farm Aid was the only show where shooters could roam around the pit for Neil, instead of being relegated to one side…I guess they changed that policy!